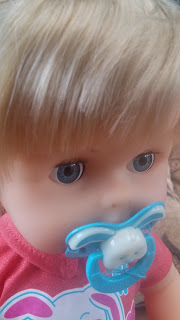 When I was a little girl I had a tiny tears doll. You got to feed her a bottle and then if you squeezed her tummy she would have a wee in the potty. It provided hours of imaginative play for my sister and I and brings back fond memories. 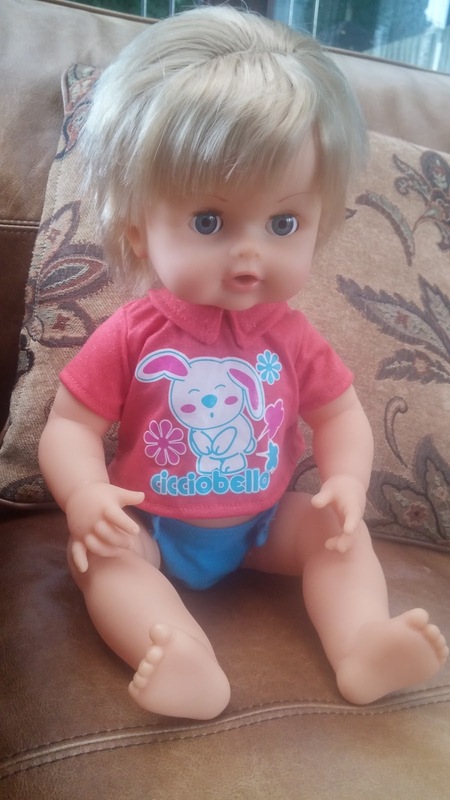 The Rumbly Tummy Cicciobello is a modern day equivalent of the doll I remember from my childhood. 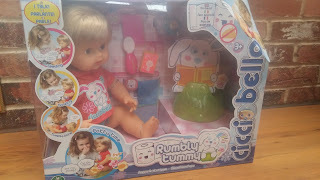 Rumbly Tummy Cicciobello comes with a wide variety of accessories, cloths, dummy, bottle, food, spoon and juice carton. Rumbly Tummy Cicciobello requires 3 AA batteries, which are not supplied. Rumbly Tummy Cicciobello then needs to be set to your chosen language. He has over 40 sentences and sounds. Rumbly Tummy Cicciobello lets you know when he is hungry or thirsty and asks to be fed. Using the accessories provided you can feed him. His face then turns yellow to say he needs a wipe and when he is clean the lights turn out. Rumbly Tummy Cicciobello also gets tummy ache, his tummy turns red to say it needs rubbing better. Of course a baby with an upset tummy leads to one thing, a poop! The girls found the noises Rumbly Tummy Cicciobello made really funny. After Rumbly Tummy Cicciobello has finished going to the toilet he needs his bottom cleaning. Rumbly Tummy Cicciobello appears to be really well made and of a good quality. He comes with a good range of accessories and kept the girls very busy in their Mummy duties. 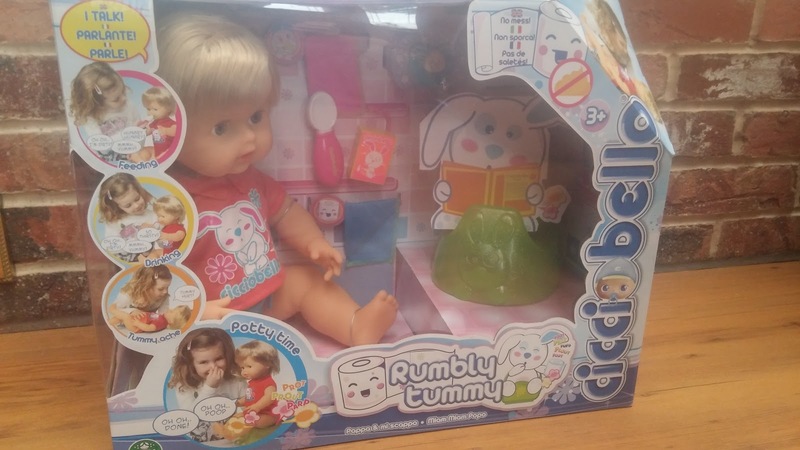 Rumbly Tummy Cicciobello was sent to us for the purpose of review and all words are my own opinion.